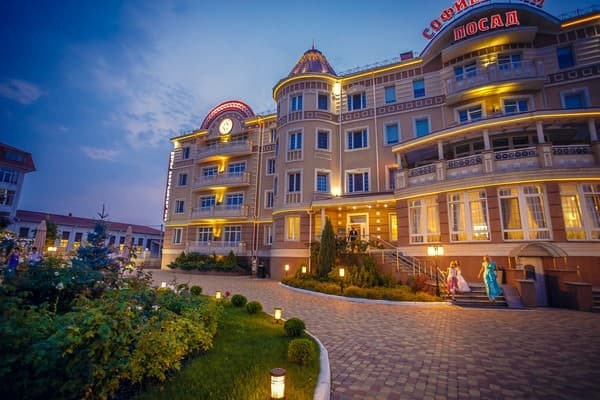 "Sofievsky Posad" is a new hotel in Kiev, which is located on the territory of the elite cottage town Sofievskaya Borshchagovka. 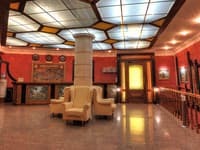 "Sofievsky Posad" is a modern hotel in Kiev, combining European comfort and service meeting international standards. The hotel offers a wide range of services for its guests. The hotel consists of 59 comfortable rooms that are equipped with everything you need to ensure that your holiday was full, and the work is efficient. 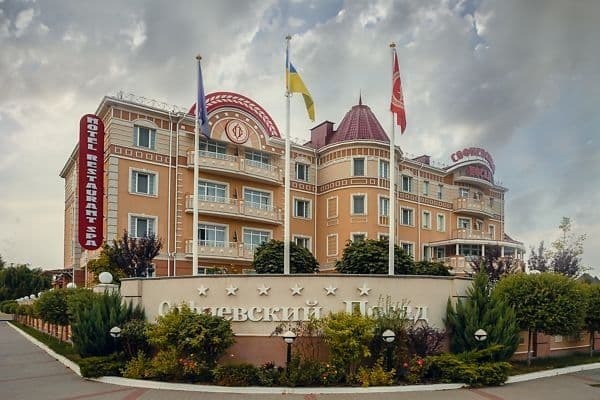 The hotel offers a restaurant with Ukrainian, European cuisine for 85 seats, as well as a large banquet hall for 150 people and a small banquet hall for 60 people, where you can hold all kinds of events: ceremonial meetings, banquets, birthdays, weddings seminars, trainings, corporate meetings. 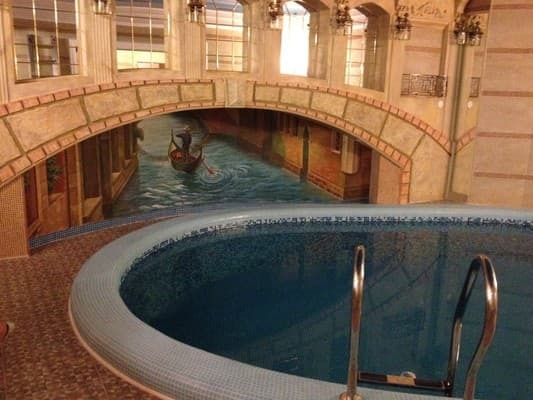 The hotel has a conference hall equipped with the latest technology, as well as a SPA-complex with 3 swimming pools, 2 jacuzzis and saunas (Roman, Finnish, infra-red). Also we offer therapeutic and health-improving massage for our guests according to the established tariffs. 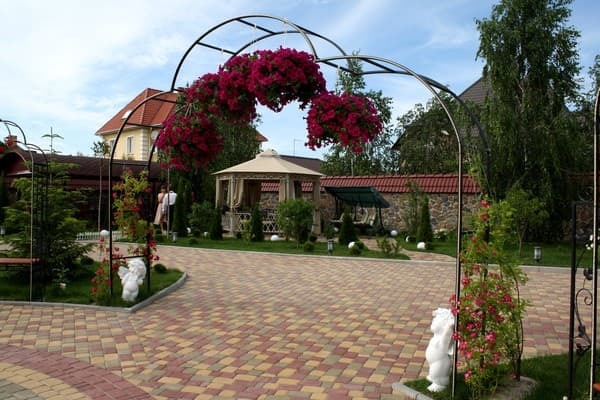 On the territory of our complex there are summer pavilions and a summer playground. The hotel provides a paid shuttle service to anywhere in the city, as well as to / from the airport and railway station. 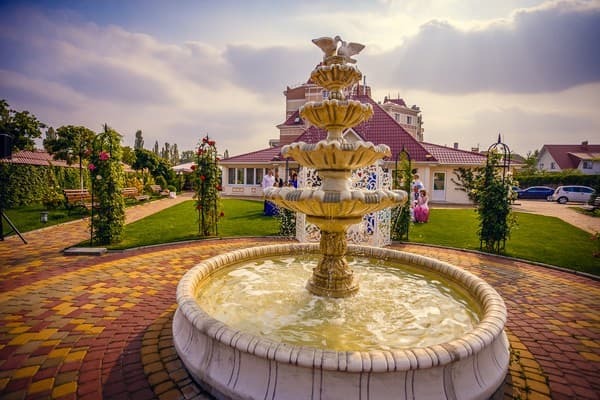 For our guests and their children we provide a variety of excursions around Kiev and the region. Pleasant moments of meetings, business events and excursions guests of the hotel can capture in the photo and video material for memory. Tariffs for photo and video services will be provided to the guests at the front desk. The distance to the city center is 13.5 km, to the central railway station - 11 km and to the airport "Borispol" - 48.8 km. Description of the room: Standard room is a full complex of comfort and service, without excessive luxury. The ideal option for those who are on a business trip, is not located to waste, or simply appreciates comfort and comfort than luxury and chic. Standard rooms have a double bed and a balcony, bedside tables, a desk, two luggage bollards, a mirror, a bathroom with a shower, LCD TV, air conditioning, safe, mini-bar, telephone, Internet access, bathrobe and slippers (optional Hair dryer , a set of mini perfumes. The price for single accommodation is 710 UAH / day. Description of the room: Twin rooms have two twin beds. Comfort and service in these rooms is not inferior to the standard level. There are rooms with balcony and without. The room is provided with everything you need: two separate beds, bedside tables, a wardrobe, a desk, two luggage bollards, a mirror, a bathroom with a shower cabin, LCD TV, air conditioning, safe, mini-bar, telephone, Internet access, bathrobe (optional ), slippers, hairdryer, a set of mini perfumes. The price for single accommodation is 710 UAH / day. Description of the room: The room consists of an entrance hall and a large bedroom. There are junior suites with and without balcony. The room is provided with everything necessary: ​​a double bed, bedside tables, a wardrobe, a desk, a mirror, a bathroom with a shower, LCD TV, air conditioning, safe, mini-bar, telephone, Internet access, bathrobe (optional), slippers, hairdryer , a set of mini perfumes. The cost of single accommodation is 840 UAH / day. 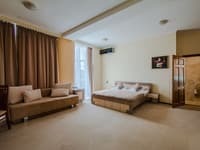 Description of the room: The room has a balcony, double bed, bedside tables, wardrobe, desk, mirror, bathroom with shower, LCD TV, air conditioning, safe, mini-bar, telephone, Internet access, bathrobe, slippers, hairdryer, perfumery. The cost of single-bed accommodation is to be specified at the time of booking. Далеко от центра, но это оправдывает достаточно низкие цены. 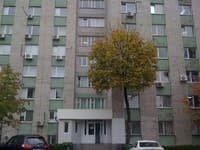 утром низкий напор горячей воды в душе. Вежливый и доброжелательный персонал, уютный номер ( проживали в стандартном двухместном), шикарный ресторан с вкусной едой, красивая территория перед отелем. Нет пандусов, приходится поднимать тяжелый чемодан, чтобы спуститься с лестницы. Не хватает указателя для главного входа - не сразу нашли, когда приехали. Светлая обстановка в отеле, чистота и гостеприимство персонала. Отличные номера, есть всё необходимое. Хорошие завтраки. The cost of additional space is 240 UAH. Accommodation with small children is possible. For children, you can use the game console. And it is also possible to organize celebration of birthday, thematic children's holidays according to the proposed scenario with the use of professional animators, artists. The hotel is located 7 minutes from the station. Metro "Akademgorodok" and 10 minutes from the station. metro "Zhitomir" and 7 km of the airport "Zhulyany Kiev". Convenient transport interchange, communication with the city center and all areas. Transport stop in 2 minutes from the hotel.Guests of the hotel can use the hotel's shuttle in the right directions at the established rates that will be provided at the time of booking or at the hotel reception. 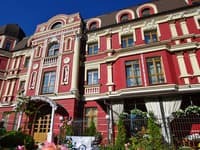 The distance to the city center is 13.5 km, to the central railway station - 11 km and to the airport "Borispol" - 48.8 km. A variety of types of massage at the established rates, wellness SPA procedures. From Art. Metro "Svyatoshin" minibus № 720, 721, 820, 369 ,. From Art. metro "Zhitomirskaya" minibus № 720, 721, 820, 369. Hotel guests can use the hotel shuttle at the established rates.